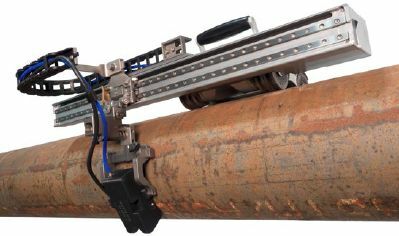 This scanning configuration is useful for smaller pipes or when the region of interest is concentrated within a specific sector around the pipe. The FlexoFORM solution's longitudinal scanning ability also makes it a powerful tool for inspecting water walls in power generation boilers. A small-diameter wedge series is available to inspect pipes smaller than 4.5 in. 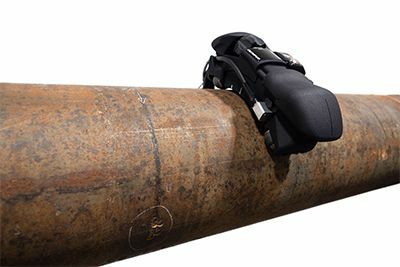 Users can manually scan the extrados (outer curve) of elbows or pipes from 1.3 in. OD up to 4 in. OD. For encoded C-scans, the SFA1-SMALL wedge series can be fitted with a Mini-Wheel™ encoder. In some applications, scanning in the longitudinal direction is preferred over scanning circumferentially. The SFA1-AUTO wedge series works on pipes with diameters from 8.625 in. OD and up, including flat surfaces.